Lakes around the world are warming, but not all water layers are warming at the same rate, and some are even cooling. Most studies have focused on summer lake water surface temperatures or analyzed short-time series. Here, we analyze a 44-year time series of water temperature from nine depths in a small mountain lake using dynamic linear models and temporal trend decomposition. We observe a significant long-term warming trend, but this occurred only from August to December in all water layers. The lake warmed ca. twice as fast (0.23 °C decade−1) as the air, but warming of the epilimnion slowed down remarkably (from 0.65 to 0.10 °C per decade) after 1993, a consequence of changing stratification timing. Deeper water layers even cooled thereafter, pointing to a stronger isolation from surface layers, which were still warming over the whole study period. This differential warming of the lake was accompanied by significant shifts of lake freezing and thawing dates leading to shorter ice-cover periods (~ 5 days decade−1). As a result, the thermal Schmidt stability of the water column strengthened, but also temperature variance in the epilimnion increased significantly, together with increasing variance and extremes of local air temperature. Our results show a significant autumn/winter warming effect of lake water together with an increasing intensity of temperature fluctuations in this seasonally ice-covered mountain lake, suggesting that current broad scale estimates of climate change impacts on lakes, based on summer temperature measurements and surface layers, do not fully reflect the effect of climate change. The online version of this article ( https://doi.org/10.1007/s10584-018-2328-6) contains supplementary material, which is available to authorized users. Lakes around the world are affected by increasing air temperatures (O’Reilly et al. 2015). In the Alps, air temperatures have increased twice as fast as the mean for the northern hemisphere and are expected to increase even faster during the remainder of the twenty-first century (Gobiet et al. 2014). In Central Europe, for example, in Austria, Germany, and in the western Carpathians, lake surface water temperature (LSWT) has increased rapidly (Novikmec et al. 2013; Dokulil 2014a; Weckström et al. 2016; Woolway et al. 2017a). Globally, mean LSWTs have increased by 0.34 °C decade−1 from 1985 to 2009, i.e., at a rate similar to that of surface air temperature (IPCC 2014), but lake warming seems to be highly variable among lakes (O’Reilly et al. 2015). Regarding the hypolimnion, it is known that also temperatures are rising in many European and North American lakes (Dokulil et al. 2006; Perroud and Goyette 2010; Richardson et al. 2017). Despite the existence of lake-specific variability, annual mean deep-water lake temperatures are correlated to a certain extent within climatic regions (Dokulil et al. 2006), suggesting a relatively high degree of correlation between lake-water temperatures and regional air temperatures (Livingstone et al. 2010). For small mountain lakes, a direct consequence of such ongoing atmospheric warming is the lengthening of the duration of the ice-free period (Thompson et al. 2009; Weckström et al. 2016). This can lead to positive or negative feedbacks, depending on the direction of the net heat flux. For example, shorter periods of ice cover can result in a stronger and longer coupling of lake and atmospheric processes during spring and autumn and in an overall lower albedo leading to greater absorption of solar radiation (Gray and Male 1981). Further, reduction in ice cover extends the period of heat loss from the lake to the atmosphere. Thus, longer ice-free periods in autumn can either extend the warming period (by increased effect of solar radiation), or intensify the loss of heat to the atmosphere (i.e., because of the lack of an insulating layer of ice and snow) (Francis et al. 2009; Rafferty 2011). However, potential influences of ice-cover duration on water temperature patterns, for example, in small mountain lakes remains unclear. Other variables that potentially affect (surface) water temperatures are the strength of the thermal stratification of the lake (Piccolroaz et al. 2015; Zhong et al. 2016), humidity (Wilhelm et al. 2006), local wind intensities (Woolway et al. 2017b), solar radiation (Schmid and Köster 2016), or water transparency (Tanentzap et al. 2008). Since water temperature, which has a dominant influence on physical and biogeochemical processes in lakes (Regier et al. 1990), is mostly linked to air temperature (Livingstone and Padisák 2007; Piccolroaz et al. 2013; O’Reilly et al. 2015; Schmid and Köster 2016) and since air temperature is projected to rise substantially in Central Europe during the rest of this century (Schär et al. 2004), a thorough understanding of long-term annual and seasonal patterns in lake temperature is crucial for both scientific and management purposes. Whereas warming of surface and deep-water layers generally alters the thermal regime in lakes in the Alps (Thompson et al. 2009), shifts in seasonal water temperature trends might additionally influence mixing patterns. Beniston (2005) observed an increase in the frequency of “heat waves” in the Swiss Alps at 2500-m above sea level since 1960, predominantly occurring in December to February. This phenomenon can affect ecological processes, such as the breakdown rate of organic matter in winter, potentially resulting in higher CO2 emissions from these ecosystems (Kosten et al. 2010). 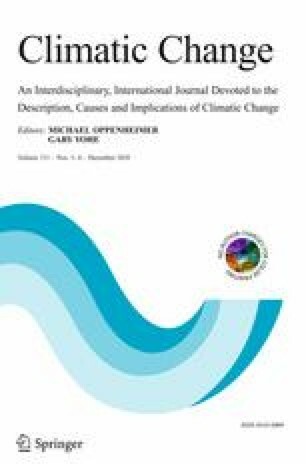 In addition to a general increasing trend in air temperature in the Alps, accompanied by shifts in seasonality, several studies also point to an increase in the frequency and intensity of extreme heat events, indicating that air temperature variability has already increased and is likely to increase further in the twenty-first century (Schär et al. 2004; Gobiet et al. 2014). Most studies on lake temperatures, however, have focused on summer LSWTs or analyzed short-time series, so that long-term month–specific trends or such non-cyclic extreme warming events could not be identified until now. Although there are clear indications that summer LSWTs are increasing, the development of inter-annual temperature variability is not known for lake ecosystems. Even less studied is the response of deep water layers to air temperatures in small mountain lakes (but see Livingstone (1993a) or Dokulil et al. (2006) for larger lakes) or the temperature changes during other seasons than summer (Coats et al. 2006; North et al. 2013; Winslow et al. 2017b). Potential seasonal changes include earlier lake warming, the earlier onset of thermal stratification and an increase of its duration, the later formation of ice cover, the occurrence of extended warm periods, higher water temperatures during winter, and greater annual variability in water temperature. Hence, discrete time–series models of lake water temperature considering more than just lake surfaces can assist policy makers in adapting lake management practices by responding appropriately, for example, to potential temporal shifts and increases in phytoplankton blooms (Gerten and Adrian 2002; Weckström et al. 2016). The overall objectives of this work were first, to assess (monthly) patterns of lake water temperature in the epilimnion, metalimnion, and hypolimnion of the mountain lake Piburger See, Austria, over a time span of 44 years (1972–2015), second, to compare long-term temperature changes in these water layers, and third, to assess potential changes in the frequency of random and non-cyclic water temperature fluctuations that might have been caused by an increase in the frequency of extreme heat events in Europe and in the surrounding of the lake. Furthermore, we examined changes in ice-on and ice-off dates, the duration of ice cover, the strength of stratification since 1972, precipitation, air temperature, and water transparency to discuss a potential influence of these parameters on water temperatures. We assumed that independent of changes in monthly patterns and random fluctuations, the LSWT of Piburger See underwent a statistically significant increase during the 44 years similar to other lakes in Central Europe (e.g., Woolway et al. 2017a). However, compared to the surface water, the temperature of deeper water layers might be less tightly coupled to air temperature, and therefore result in lower warming rates as found by Winslow et al. (2015). Additionally, we hypothesized that lake water temperature would become increasingly variable as a response to an increase in the frequency of weather extremes. We tested these assumptions using time-series analysis techniques such as dynamic linear models and time-series decomposition. Piburger See is a sub-alpine dimictic and mostly holomictic lake situated 913 m above sea level (m a.s.l.) in the eastern Alps in Tyrol, Austria, located in the alpine climate zone (Bobek et al. 1971). The lake is 800 m long has a maximum depth of 24.6 m, a mean depth of 13.7 m, and a volume of ~ 1.84 × 106 m3 of water. It is fed from a relatively small catchment (265 ha), an area 19.8 times larger than the lake surface area (13.4 ha), and has a retention time of approximately 2 years. Sub-surface inflow is estimated to contribute 19.2% to total inflow (Gattermayr 1977), which accounts for approximately 1.96 × 105 m3 year−1 or 10.7% of total lake volume. In the 1960s, the lake became eutrophic and restoration activities, including the installation of an Olszewski pipe to export anoxic and nutrient-rich hypolimnetic waters, were implemented in 1970 (Pechlaner 1979). The discharge of the pipe decreased from initially 0.01 m3 s−1 to nearly zero in 2009. Assuming a discharge of 0.01 m3 s−1, about 17.2% of the lake volume was exported annually by the Olszewski pipe in the early 1970s. Air temperature and precipitation data were obtained from the weather station in Oetz, located at 760 m a.s.l. approximately 850 m from the lake (Fig. S1). The station registers air temperatures three times a day (at 07:00, 14:00, and 21:00) and the precipitation once a day (in mm day−1). The ice-in date was defined as the date on which the lake became completely ice-covered, and the ice-out date as the date on which it became completely ice-free. The dates are based on daily observations by the local fishery guard and residents and further supported by webcam registration during the last years. A long-term dataset of water temperature was compiled from discrete monthly measurements made with a calibrated thermometer (resolution 0.1 °C) located inside a 5-L water sampler from January 1972 until December 2015. The water samples were collected around noon (thereby reducing the bias in the data, as diel temperature range are pronounced in small lakes (Woolway et al. 2016)) at the center of the lake at the depths of 0.3, 3, 6, 9, 12, 15, 18, 21, and 24 m. Although LSWT of large and deep northern hemisphere lakes seems to spatially vary across the lake surface (Woolway and Merchant 2018), this study consistently obtained water temperature across a depth profile from the same position on the lake (Fig. S1). Bathymetric data was obtained in the early 1970s with a resolution of 1 m (and 0.5 m for the surface layer). To test for potential changes in water transparency during the study period that can affect the lake heat budget and water temperatures (Tanentzap et al. 2008), we also analyzed the trends in Secchi depth and DOC for each depth, which in this lake is mainly chromophoric (Laurion et al. 2000). Measurements of all parameters were taken the same day on the same location of the lake. However, the time series for these parameters were shorter, starting in 1999. The method for DOC analysis used in our laboratory is described elsewhere (Laurion et al. 2000). where M is the mass of the lake water in grams, T is water temperature in Kelvin (K), and s is the specific heat capacity for water in J/(kg K). We used a specific heat capacity of 4184 J/(kg K), as it is constant for water temperatures between 0.1 and 70 °C. Lake water temperature measurements and DOC data from individual depths were volumetrically averaged to yield the volume-weighted mean water temperature in three operationally defined water layers: the epilimnion (0.3 m, 3 m, and 6 m); metalimnion (9 m, 12 m); and hypolimnion (15 m, 18 m, 21 m, and 24 m depth), which layers accounted on average for 46.2%, 26.4%, and 27.4% of the total lake volume, respectively. Additionally, we separately analyzed LSWT. We calculated the Schmidt stability (Schmidt 1928; Idso 1973), a measure of the resistance of the water column to mechanical mixing (i.e., a measure of the strength of stratification). We resolved each time series into long-term trends (using a 12-month moving average), the annual cycle, and random (non-cyclic) variation using a classical seasonal decomposition of the time series. Along the long-term trend series, we used dynamic linear models (dynlm) to describe and test the alterations of the response variable (t test) and the differences between water layers. Locations of structural changes (so-called breakpoints, where regression coefficients significantly shift from one to a different one) in time-series data were identified based on the reduction of sum of squares (Zeileis et al. 2002). For water and air temperature, precipitation, and Schmidt’s stability, we identified month-specific trends by linear regression. We used linear models to test for increasing temperature variability, thus, we distinguished between the total annual variance and the variance associated with non-cyclic patterns (temperature fluctuations remaining after subtracting the 12-month moving average and the annual cycle). Long-term correlation of water and air temperature data was analyzed using long-term trend data and Pearson’s correlation coefficient. All data were checked for normality (Kolmogorov-Smirnov), autocorrelation (ACF), influential measurements (leverage and studentized residuals), and heteroscedasticity (if the variance of data is constant over time). All plots and analyses were compiled in R (R Core Team 2015) using the packages rLakeAnalyzer (Winslow et al. 2017a), zoo (Zeileis and Grothendieck 2005), dynlm (Zeileis 2014), strucchange (Zeileis et al. 2002), and timeSeries (Wuertz et al. 2017). The 12-month moving average of monthly mean air temperatures increased significantly over the last few decades, with a mean slope of 0.13 °C per decade (p < 0.001) (Fig. 1a). Before 1993, where the most pronounced breakpoint of air temperature trend was identified, air temperatures changed significantly (p < 0.05) in January (− 0.2 °C decade−1) and July (+ 0.11 °C decade−1) (Fig. 1b). After 1993, air temperatures decreased significantly between − 1.7 and − 3.6 °C decade−1 in March to June and increased significantly in August to December by 1.2 to 4.0 °C decade−1 (Fig. 1c). The moving average of maximum air temperature per month increased by 1.2 °C per decade (R2 = 0.69, p < 0.001) with a distinct heat event in the early 1990s and a regime shift in the early 2000s (Fig. 1d). Furthermore, the intensity of the random and non-cyclic fluctuations of maximum air temperature increased significantly (p < 0.001, Fig. 1e). Precipitation (mm) increased slightly over the study period by 1.6 mm decade−1 (R2 = 0.06, p < 0.001) (Fig. S2a), with significant month-specific changes in August only (+ 12.2 mm decade−1) (Fig. S2b). The concentration of DOC increased slightly, but significantly (R2 = 0.11, p < 0.001) by 53 μg L−1 decade−1 (Fig. S3a). 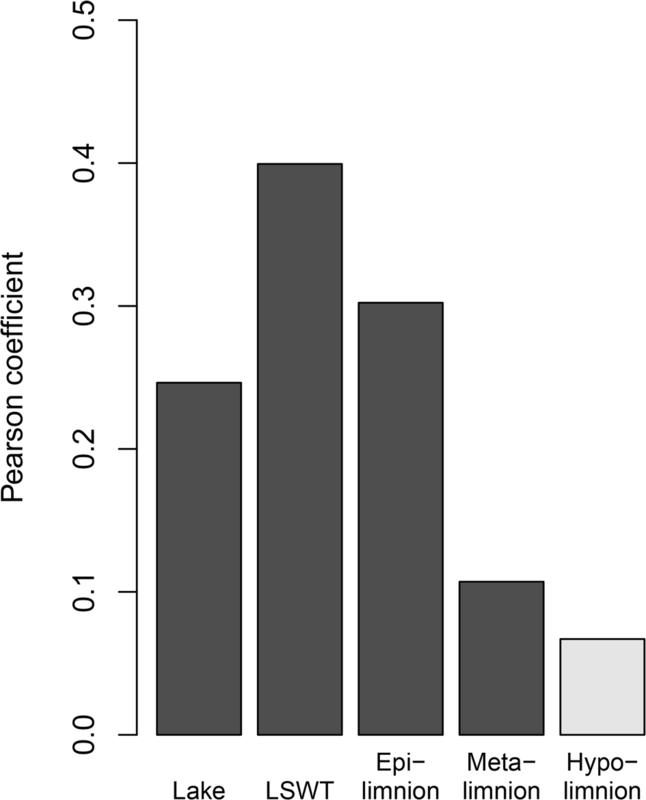 In contrast, Secchi depth did not change significantly during the study period (Fig. S3b). Besides the observed long-term trends, both parameters fluctuated inter-annually during the study period. The dates of ice-on and ice-off shifted significantly (p < 0.001), with an ice-on delay of 3.7 days decade−1 and an ice-off earlier by 1.7 days decade−1. This led to a constant and significant shortening of the ice-cover duration since 1972 (p < 0.001) by 5.1 days decade−1 or 22 days during the entire 44 years of the study period (Fig. S4). Years with particularly late ice-on dates were 1993 (ice-on in December 27), 2000 (December 24), 2002 (January 6), 2004 (December 23), and 2014 (January 11). The heat loss through the outflow of deep water via the Olszewski pipe was around 1.4% of the total heat content of Piburger See in the early 1970s and decreased to 0–0.28% since 2000 (Fig. S5), as discharge of the deep-water withdrawal decreased from 10 to 0 L s−1 due to an accidental obstruction of the pipe. The hypothetical discharge by the surface outlet instead of the Olszewski pipe only would have resulted in a marginally higher heat loss (1.95%) over the whole study period (Fig. S5). The annual mean epilimnetic temperature increased at an average rate of ~ 0.36 °C decade−1 (R2 = 0.49, p < 0.001) (Fig. 2a), corresponding to an increase from 9.3 °C (average during 1972–1981) to 10.5 °C (average during 2006–2015). Rates of increase in the metalimnion (0.18 °C decade−1; R2 = 0.31, p < 0.001) and hypolimnion (0.07 °C decade−1; R2 = 0.24, p < 0.001) also differed significantly from zero, but were lower than in the epilimnion (Fig. 2a). We identified structural breaks of temperature trends in all water layers. The most pronounced breakpoint for water temperature was found in 1993 (April) for all water layers. Generally, the highest rates of temperature increase occurred at the lake surface, with a mean rate of ~ 0.38 °C decade−1 (R2 = 0.43, p < 0.001). However, after 1993, the increase in LSWT was only 0.16 °C decade−1 (Fig. 2b). On average, the mean water temperature of the whole lake increased by 0.23 °C decade−1 (R2 = 0.47, p < 0.001), for example, from 6.8 °C in 1972 to 8.0 °C in 1993, followed by a decrease to 7.4 °C in 2015 (Fig. 2b). Air temperature and water temperatures of surface water, the whole lake, the epilimnion, and the metalimnion were correlated, although with decreasing linkage intensities, while no significant linkage was found with the hypolimnion (Fig. 4). Overall, the lake warmed almost twice (1.8×) as fast as the ambient air temperature, whereas this factor was 2.9 for the surface of the lake, 2.8 for the epilimnion, 1.4 for the metalimnion, and 0.5 for the hypolimnion. Monthly decomposition of the time-series data indicated a large, statistically significant long-term temperature increase in all water layers from August through December. In these months and for the epilimnion, a significant (F-test; p < 0.001) warming occurred ranging from 0.53 to 0.80 °C decade−1, while rates of long-term month–specific warming/cooling in the other months were not significantly different (p > 0.05) from zero (Fig. 3). In the lake surface, the highest month-specific warming was observed in the same months as in the epilimnion and ranged from 0.72 to 0.88 °C decade−1 (Fig. 3). The metalimnion and hypolimnion showed significant, but lower warming trends. Both layers, however, warmed during the same months as the lake surface and the epilimnion, thus leading to an increase in temperature from August through December of the whole water column (range 0.41 to 0.54 °C decade−1). On average, the Schmidt stability of Piburger See fluctuated seasonally between 0.8 ± 1.5 J m−2 in winter and 625.1 ± 80.5 J m−2 during summer stratification. Over the study period, Schmidt stability (moving average) increased by 15 J m−2 decade−1 (Fig. 5a). We observed a significant long-term month–specific increase in Schmidt stability in August (50 J m−2 decade−1), September (48 J m−2 decade−1), October (37 J m−2 decade−1), and November (14 J m−2 decade−1), but not in December (Fig. 5b). Over the study period, we identified two significant structural breakpoints of stability trends, namely, in 1985 and 2000, and a high stratification intensity around 2003 (Fig. 5a). 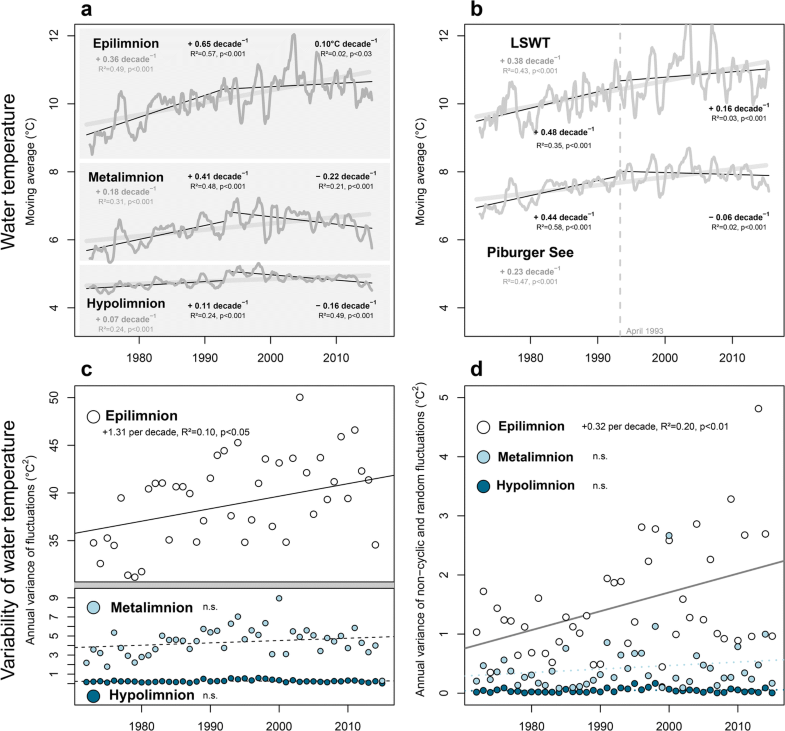 Water temperature variability increased significantly in the epilimnion from 1972 to 2015 (p = 0.041), but not in the metalimnion and hypolimnion (p > 0.05) (Fig. 2c). Similarly, to the overall temperature variation, the intensity of the remaining random, non-cyclic temperature fluctuations, which is independent of trend and seasonality, increased in the epilimnion (p < 0.01), but not in the metalimnion and hypolimnion (p > 0.05) (Fig. 2d). The main findings of our analysis of long-term lake water temperatures in Piburger See are the identification of a month-specific response to climatic warming during the last 44 years and the increasing frequency and intensity of irregular temperature extremes in the lake. Many studies have analyzed the long-term effect of climate change on lake water temperatures by considering annual average conditions, rather than monthly fluctuations (e.g., Dokulil (2014b) for monthly patterns for LSWT) or extreme events such as heat waves or short cold snaps. In previous studies, water temperatures for either the lake surface or the whole lake have been analyzed. In contrast, our work disentangles not only overall temperature trends in different depths, but also month-specific patterns. Further, it compares the extent of random temperature fluctuations across the water column and during all seasons. In particular, we found that lake water warmed considerably from August to December, at clearly different rates in different layers of the water column (Fig. 3). Furthermore, we identified an increasing intensity of random temperature fluctuations in surface waters of the lake (Fig. 2d). The export of water through the Olszewski pipe had only a marginal effect on the heat budget of Piburger See (see Fig. S5) and can, thus, not explain the trends observed. Piburger See warmed at a consistent rate (0.23 °C decade−1), almost twice as fast as the air (0.13 °C decade−1) at this site. This contradicts the prediction of Schmid and Köster (2016) that the average LSWT of a lake in the Alps increases by ~ 75–90% of the air warming. 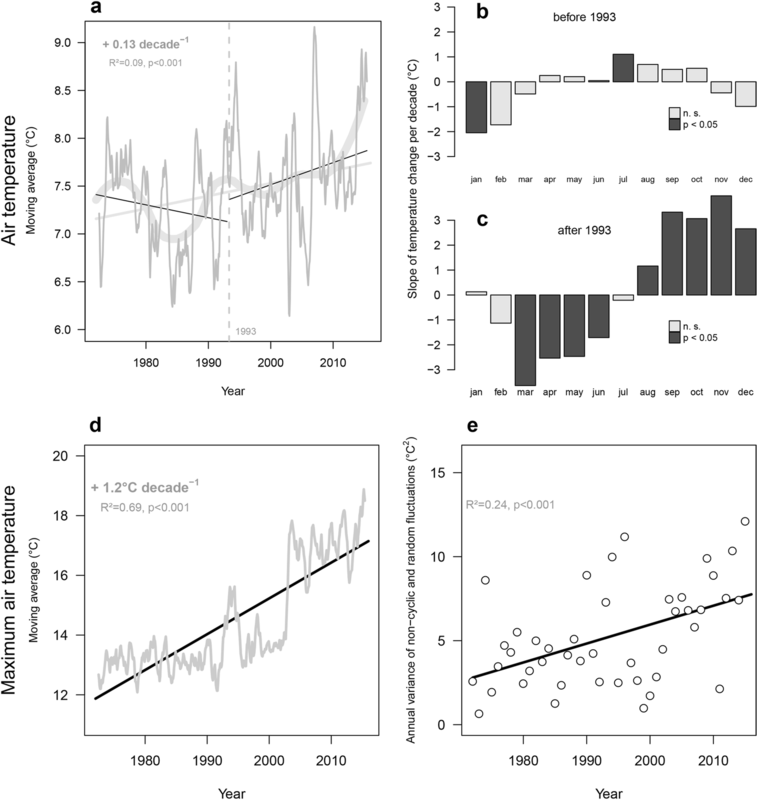 The LSWT and the epilimnion of Piburger See increased by 0.38 °C and 0.36 °C decade−1, respectively, slightly faster than the reported worldwide average (0.34 °C decade−1, O’Reilly et al. 2015). While most studies compared the temperature in the surface layer only (LSWT), we used the epilimnion or, more precisely, the depths corresponding to the epilimnion by the end of summer, which comprises ~ 46% of the lake volume. In analyzing not just LSWT, but temperatures at different depths in Piburger See, this study revealed that the warming trend of the whole lake stopped in 1993 (Fig. 2), followed by a small decrease of − 0.06 °C decade−1. However, the air temperature in the nearby meteorological station, although more variable from year to year, did not decrease and precipitation, an indicator of changing surface or groundwater input, changed only marginally. One possible explanation for the reduced warming is that the lake reached the mean annual air temperature around 1993 (see Figs. 1a and 2b), so that the year-round temperature difference between air and water became minimal. There was also a conspicuous seasonal change in air temperatures (Fig. 1b, c), which cooled during the first half of the year by approximately − 0.6 °C decade−1 before 1993, but by ca. − 1.9 °C decade−1 after 1993. The warming in the second half of the year was only ~ 0.2 °C decade−1 before 1993, but ~ 2.3 °C decade−1 after 1993. While temperatures in the metalimnion and in the hypolimnion cooled after 1993, the trends in the lake surface and the epilimnion were still positive, but much lower than in the period before. Water temperature generally increased from 1972 to 2015, which is in line with the identified thermal regime shifts in Central European lakes within the last decades (Woolway et al. 2017a) and the global regime shift in the late 1980s in different natural systems (Reid et al. 2016). However, the identified reduced warming in the upper—and cooling in the deeper—water layers starting from the 1990s is new for mountain lakes and lakes in general. This phenomenon is even more astonishing as the local air temperatures continued to increase after 1993 and thus urges for a verification on a broader geographical scale distribution of lakes. The extreme maximum air temperatures and high local air temperature variation in 1993, potentially intensified by the regional temperature shift in the late 1980s (Reid et al. 2016), resulted in a long stratified period and consequently in a particularly late ice-cover formation on Piburger See. Based on this, we hypothesize that the timing of stratification and its length can shorten the mixing period of the lake and thus limit the heat transfer from surface to deeper water layers (as observed by Ambrosetti and Barbanti 1999). Such processes potentially caused the cooling or reduced warming of deeper waters in this mountain lake. The decreasing correlation of air and water temperatures with increasing depth (Fig. 4) verifies that lake surfaces are under tight physical control of climate drivers. Further, it shows that the lake surface and the lake as a whole, not the different water layers, are the best integrators of local air temperatures and thus the best sentinels of climate change (Adrian et al. 2009). The calculated increase in variability and variance of water temperatures (Fig. 2c, d) supports these assumptions, namely, that a separation of the epilimnion from deeper water layers leads to a greater temperature variability of upper water layers from year to year and to a closer similarity of temperature fluctuations between surface water and air. However, changing temperatures of lake water cannot be attributed to changes of air temperatures alone. O’Reilly et al. (2015) showed that despite the broad global coherence in air and lake temperature increase, both trends can often diverge considerably. In lakes with low correlation between air and lake water temperature, other factors are supposed to control their heat budget. Besides potential effects of wind intensity and direct solar radiation on the ice-cover stability (Novikmec et al. 2013), these factors might also be relevant for the mixing regime (Woolway et al. 2017b) with consequences for the temperature of lake water. Unfortunately, long-term data on these parameters were not available for Piburger See. In addition to external factors, water transparency and dissolved organic matter concentration are reported to influence thermal regimes of certain lake types (Tanentzap et al. 2008). The optical characteristics of Piburger See (using DOC concentration and Secchi depth as proxies for changes in water transparency), however, did not change significantly or did not show a consistent trend over time. Further, the observed fluctuations of these parameters are attributable to manifold drivers (e.g., catchment properties, weather, atmospheric deposition, land management) summarized in Clark et al. (2010), but were not associated with long-term temperature trends in this mountain lake. We assume, therefore, that water transparency did not influence the observed trends in water temperature and in the isolation of deeper water layers from the epilimnion in Piburger See. For temperate and polar lakes, the ice cover is the most effective factor uncoupling lake water from atmospheric influences (O’Reilly et al. 2015). Its duration and the timing of ice-on and ice-off will thus regulate the lake heat budget. Recent studies found that the overall warming effect of lake summer surface temperatures might be more pronounced in ice-covered lakes, which typically warm faster than local air (e.g., O’Reilly et al. 2015). Later ice-in dates, shorter duration of ice coverage and rising air temperatures in autumn can cause longer and stronger water stratification periods (Gray and Male 1981; Thompson et al. 2009; O’Reilly et al. 2015; Weckström et al. 2016), leading to a longer separation of deeper water layers from atmospheric influences. In Piburger See, stratification intensity generally increased inter-annually and most pronouncedly from late summer to autumn, indicating extending periods of a stratified water column and leading to increasing month-specific temperatures in late summer, especially in the upper water layers. Such strong thermal stratification events uncouple the upper water layers from deep ones, with consequences for the whole water column, which warmed on average by 0.44 °C before and cooled by 0.06 °C after April 1993 (Fig. 2b). In addition to the length of the ice-free or the stratification period alone, the exact timing is considered to be crucial for the seasonal evolution of (surface) water temperatures (Piccolroaz et al. 2015). For example, in Lake Superior, lake water warmed faster than ambient air, a consequence of an early summer stratification event (Austin and Colman 2007). Similarly, very late ice-on dates and earlier ice-off dates cause a reduced isolation of the lake from the atmosphere and promote heat loss from the lake in periods when air temperature drops below lake temperature (Schertzer et al. 2003; Francis et al. 2009; Zhong et al. 2016). Such a heat loss due to missing isolation might have occurred in winters starting from 1993 and could thus explain the decreasing water temperatures from thereon in Piburger See. Generally, rates of heat loss in autumn are higher in deep lakes (Oswald and Rouse 2004), but the role of the ice cover is not known so far. Thus, we conclude that the inter-play of rising and seasonally shifting air temperatures, of changing stratification length and timing and of yearly ice-on and ice-off dates, most probably influenced the overall temperature trend of Piburger See. Water temperatures increased at a higher rate in late summer and early winter, when the air warmed most rapidly (Fig. 1c). We attribute this to the absorption of incoming long-wave radiation and heat storage during the summer and autumn period (Coats et al. 2006), leading to the extension of the stratification of Piburger See and to constant and significant warming of all water layers during winter months. Such a heat transfer due to the absorption of solar radiation and consequent heat conduction within the water column was observed in a perennially ice-covered high–arctic lake (Vincent et al. 2008), but might also be important for seasonally ice-covered and small lakes (Sharma et al. 2015; O’Reilly et al. 2015). Generally, ice formation on Piburger See is occurring later each year, as observed in several lake ecosystems in the northern hemisphere (Benson et al. 2012). We found an averaged inter-annual delay of ice formation corresponding to ~ 5 days decade−1 from 1972 to 2015, leading to an extension of the ice-free period especially in autumn. The month-specific warming of the lake can be amplified by the shift of ice-on dates towards the end of the year, which thereby creates a positive feedback, namely, that warmer air and absorption of solar radiation can heat the lake water for longer periods (Wetzel and Likens 2000; Zhong et al. 2016), and even accelerate the shortening of the ice-cover period. In contrast, as the air cooled from February through May, and most strongly (− 1.8 °C decade−1) in March, the lake is generally still ice-covered (Fig. S4). Thus, the cooling trend of the air is not conveyed to the lake water, with the ice acting as barrier against heat loss. This is also reflected by the slight, insignificant warming or cooling of lake water from January to March (Fig. 3), which takes place completely uncoupled from air temperature trends (Fig. 1). However, the cooling air in spring months might be the reason why the ice-out date shifted only by 1.7 days decade−1, while the ice-on date occurred 3.7 days decade−1 later. The significant warming from August to December (Fig. 3), on the other hand, was comparable to the month-specific warming of air (Fig. 1c) and was associated with the month-specific alterations of Schmidt’s stability in Piburger See (Fig. 5b), which has also been observed in other mountain lakes (Ficker et al. 2017). We argue, therefore, that the inter-play between air temperature, lake isolation via ice-coverage, and lake stratification caused month-specific temperature changes in the past and additionally contributed to the overall warming and cooling of Piburger See. However, further investigation of the effect of absorbed radiation by lake water on its temperature pattern during winter is necessary, as this was not assessed in our study. Nevertheless, this study showed that temperatures of surface and deeper water layers increased significantly mainly from August to December, suggesting that the effects of climatic warming seem to be more dramatic from late summer/autumn to early winter than during spring and summer. The identified discrepancies of month-specific temperature changes further underline the claim of Winslow et al. (2017b) that trends in summer water temperatures do not fully reflect the thermal impact of climate change on lakes. Since most studies focus on lake surface water temperatures (e.g., Livingstone and Dokulil 2001; Dokulil 2014b) or during summer months only (e.g., Sharma et al. 2015; O’Reilly et al. 2015), the patterns observed in Piburger See are particularly relevant for the understanding of season-specific alterations in lake ecosystems. Extreme patterns of water temperature (i.e., higher variability around moving averages) became more frequent and intense in Piburger See during the study period. Such temperature fluctuations are most probably a consequence of the observed long-term increase of maximum air temperatures and non-cyclic temperature extremes of local air from 1972 to 2015 (Fig. 1d), with the most conspicuous alterations around 1993 and 2003. Generally, Meehl and Tebaldi (2004) and Christidis et al. (2014) observed overall increases in frequency (~ 30% or more), duration (+ 3.7 days), and intensity of long- and short-term heatwaves for Central Europe in the last decades. Our work demonstrates that such air temperature extremes are generally conveyed to lake water. Variability in epilimnetic temperatures in Piburger See increased by 15% during the study period, while fluctuations in other water layers did not change significantly (Fig. 2c). Besides the inter-annual variability in lake surface water temperature (i.e., variance from running average line), which describes the overall extent of seasonal variation within years, the data from Piburger See also showed an increase in the frequency and intensity of non-cyclic and random temperature extremes (Fig. 2d). Besides increasing the non-cyclic temperature fluctuations in lake surface waters, short-term air temperature extremes (e.g., 1993, 2003, see Fig. 1d) also influenced average lake temperatures, yearly ice-on dates, and stratification intensities in Piburger See. This study has identified increasing frequency and intensity of water temperature extremes as response to heat events, and a month-specific warming between autumn and winter as significant consequence of climate warming. Further, the analysis revealed a general increase in mean water temperatures in different water layers and the lengthening of the stratified period. These changes can have severe effects on key aspects of the functioning of lakes, such as oxygen dynamics (Livingstone 1993b) and nutrient cycling (Thies et al. 2012), as well as on food webs (Hampton et al. 2017). Particularly, the detected higher warming trends during the second half of the year and a decoupling of epilimnetic from deep-water layers (which showed a reversal of warming and a significant cooling after 1993) could affect biological processes. Overall, vertical stratification, seasonal differences, and inter-annual variability increased significantly during our 44-year observation period and may further increase upon climate warming. We suggest that this late summer/autumn to early winter warming might affect seasonal cycles in mountain lakes, such as the intensity and duration of mixing, but also biogeochemical processes and the metabolic activity of organisms (Hampton et al. 2017). Furthermore, it can favor cyanobacterial blooms in summer as has been shown, for instance, for the harmful Planktothrix rubescens (Dokulil and Teubner 2012). Given the importance of water temperature for the ecology of lakes (Gerten and Adrian 2002; O’Reilly et al. 2003; Weckström et al. 2016) and the fact that lake temperatures are altering worldwide (O’Reilly et al. 2015), our findings of increasing water temperature fluctuations due to heat waves are important to understand lake thermal dynamics and the consequences of climate change on lake ecosystems. Open access funding provided by the University of Innsbruck. We thank the Hydrologischer Dienst Tirol for data on air temperature, Gry Larsen and Salvador Morales-Gomez for chemical analyses and especially Josef Franzoi for the long-term measurements of water temperature and Secchi depth. Piburger See is part of the LTER “Tyrolean High Alps” site. We also thank David Livingstone, Catherine O’Reilly, Magdalena Nagler, and three anonymous reviewers for helpful comments on the manuscript.